Okay kapwa ko Pinoy, at which airport do you hear announcements that are funniest or weirdest? Thailand? Indonesia? Malyasia? China? Japan? Korea? Have you considered our very own airports? Don’t tell me you have not heard that! It happens everyday at Mactan airport and just about elsewhere. 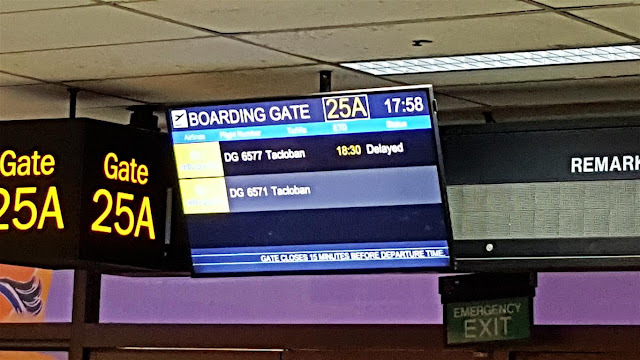 Bakit kelangan pang sabihin yung “NOW”? Tanggalin na dapat yan kasi alangan namang meron “you are LATER requested". Di ba? The fact na nag-a-announce ka, that already means ngayon, as in NOW NA! Bakit “AT”? Hindi ko yata na-encounter ang grammar na yan from kinder all the way to English 5 in college. Di ba “proceed to” or “check at”? Ahm, ambot lang! Di ba ang “small” hindi ginagamit sa ganyang context? Dapat yata “LITTLE CHILDREN” yan. Oh eh, bakit di nalang kasi sabihin “Infants and Kids” or “infants and children”. I understand where this is coming from. The Tagalog version of this announcement is trying to say “maliliit na bata”. Kasi nga naman, baka mauna mag-board si Lola kasama ang anim nyang mga anak na puro malalaki nang sanggano, kaya kelangan “mga pasaherong me kasamang maliliit na bata” – hindi yung mga gurang na! But I still say “small” is not proper here. Improperly redundant na ang tunog nyan sa akin. “As soon as” already refers to a future eventuality, so hindi na kelangan lagyan ng “will be”, di ba? I think it should be “as soon as ground servicing of your assigned aircraft IS completed”. Note tinanggal ko yung “the” before “ground”. And I am not even comfortable with still mentioning “assigned” dahil assumed na yan. tingin ko lang! Talaga naman di ka pa manginig dyan sa panawagan na yan! Even if you translate those three words to Tagalog, tunog OA pa rin. Ang huling konting natitirang panauhin? Duh! Funny says one friend – but I am sure he meant nakakahiya! So I said, “talaga”! There are more, but let’s talk about them later! Or if you have your own 'collection' add them at the comments section below!